The German poet, writer, playwright and polymath Johann Wolfgang von Goethe (1749-1832) spent a year in Strasbourg, 1770-1771, studying Law. He described his time there in his autobiography, Aus meinem Leben. Dichtung und Wahrheit, 'From my Life. Invention and Truth', written over a period between 40 and 60 years after the fact. His time there is filled with the restless curiosity and relentless self-examination that he displayed throughout his life. You don't become a genius by just sitting around drinking, unfortunately. I was especially frightened by the vertigo that afflicted me whenever I looked down from a great height. I wanted to cure [this defect], but, not wanting to waste a lot of time, I did it very intensively. All alone I climbed to the highest point of the tower of the cathedral and sat in the so-called 'neck', just under what is called the 'button' or 'crown' of the tower. I sat there for a good quarter of an hour, until I finally dared to step out into the open, where one can stand on a rectangular platform, scarcely wider than a half a metre, and without anything much to hold on to. From there you can look out upon the endless landscape, uninterrupted by the objects in the locality and the ornamentations of the building. It is just as though one has been lifted into the air by a hot-air balloon. I repeated that torture of fear and anxiety until I became completely at ease with the situation. Ever since, whether on journeys in the mountains and geological studies, or on large buildings, where I bet with the joiners about walking across open beams and along the window ledges of buildings, or in Rome, where one has to do these intrepid things in order properly to see important works of art, this training has been very useful to me. 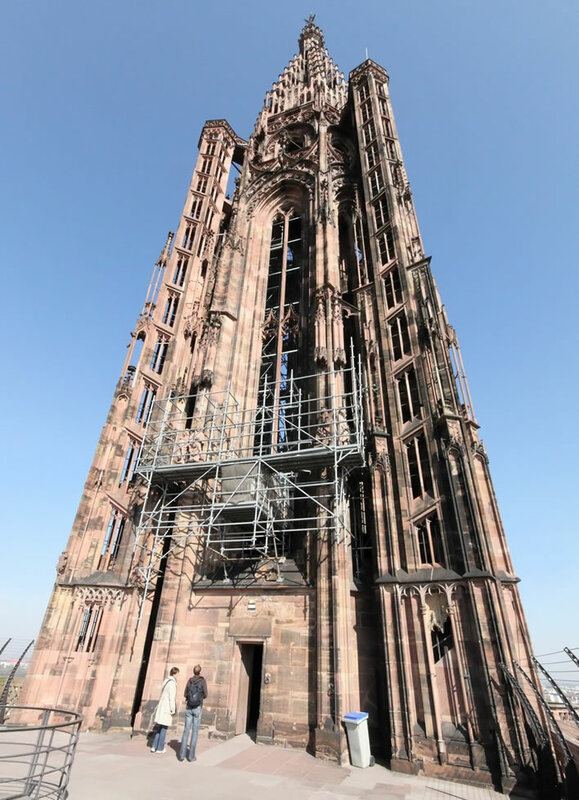 Strasbourg Cathedral does have a remarkable tower and spire. There were supposed to have been two of these, but only one was ever built. 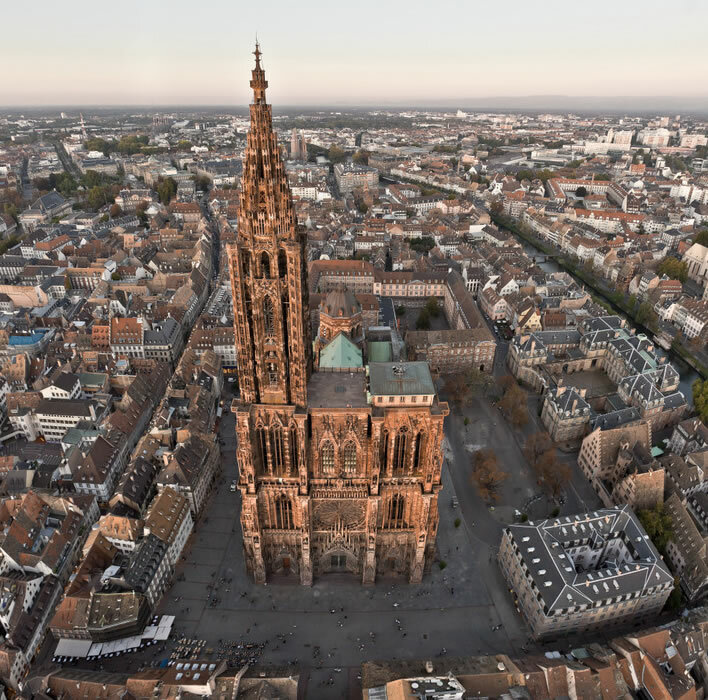 Aerial view of Strasbourg Cathedral showing the west front of the cathedral topped of by the main platform. The small building on the platform contains the entry and exit points of the steps from the street level to the platform. The middle tower begins from the platform and rises 34 metres. The steps to ascend it are in the four octagonal towers at each corner. The spire, 42 metres in height, rests on the middle tower: there are two small platforms one above the other under the 'crown' at the very top. Image: © Stéphane Compoint für Pèlerin, arte.tv. The tower, 142 metres high, is divided into three sections. The first section, the west-front of the cathedral proper, is 66 metres high. 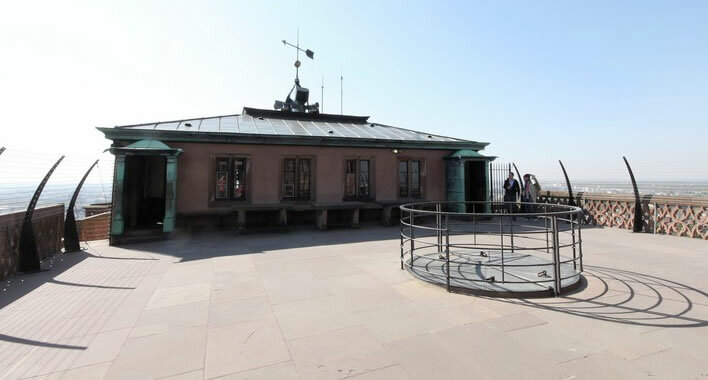 On its top is the main platform, a walled-in space with anti-suicide fencing which is open to the public during daytime hours. If you want to commit suicide, don't do it here – just use a French pedestrian crossing like everyone else does. Pay five Euros and you can trudge up the 332 steps to get to the main platform, from which there is a remarkable view of the town and surrounding Alsatian countryside. Of course, this is France, so if you are a member of the Ministry of Culture you get in free. You need to be in good shape, of course. One winding stair takes you up, a different one gets you down. 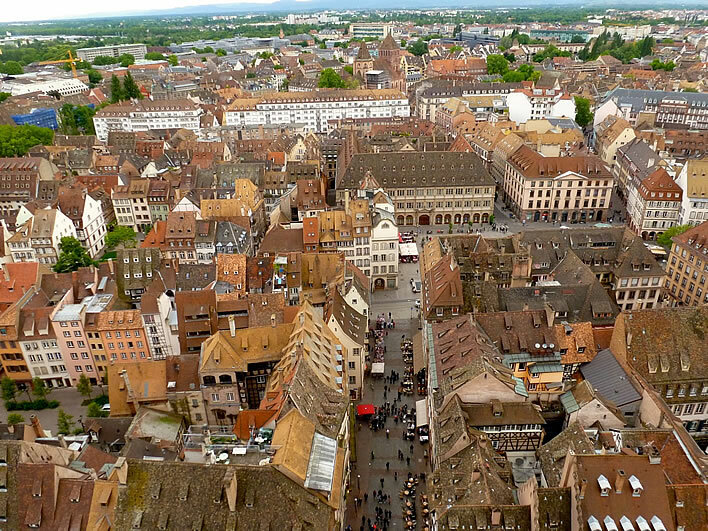 A roofscape of Strasbourg, seen from the main platform. Image: 'Stroud All Over' website. 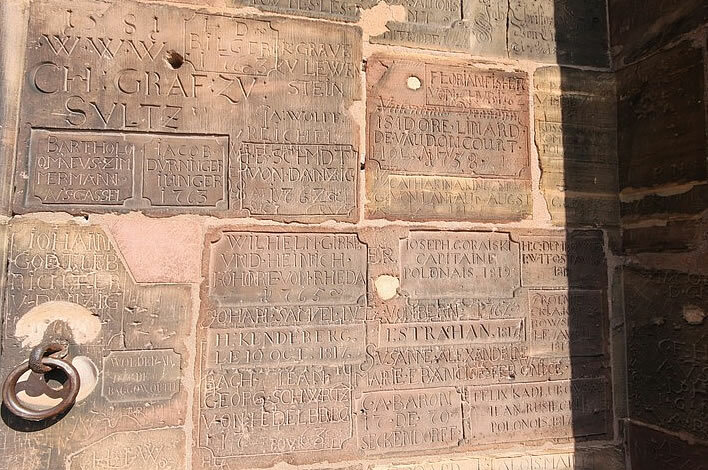 The ants of Strasbourg, a.k.a. 'tourists'. Image: Vogelperspektive vom Straßburger Münster, Wege zum Urlaub. The middle tower and the spire were closed for public access sometime in the 1960s. Principally for public safety, but anyone seeing the felt-tip pen grafitti on the walls of the steps to and from the main platform can think of other reasons. Left: the middle tower with at its corners the octagonal towers known as the Schnecken, the 'snails'. The lower two-thirds of each 'snail' contains a stack of six hexagonal staircases. The top third of the middle section is free-standing with buttresses and contains four tight spiral staircases. Both sets of staircases are exposed on the outer sides. 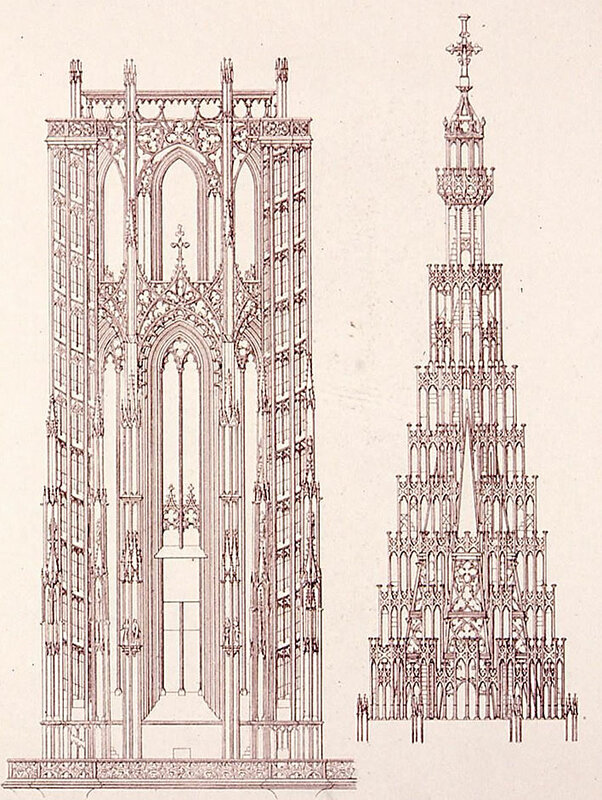 Right: the spire, showing the two small platforms under the 'crown'. The first of these is 132 metres above the ground. To get to this you have to take one of the eight extremely steep and extremely narrow stairways that follow the outside of the spire. For anyone with a sense of self-preservation, going up them is bad enough – descending them is awful. Ditto the four metres that you need to overcome in order to get to the topmost hexagonal platform, the one of which Goethe wrote. 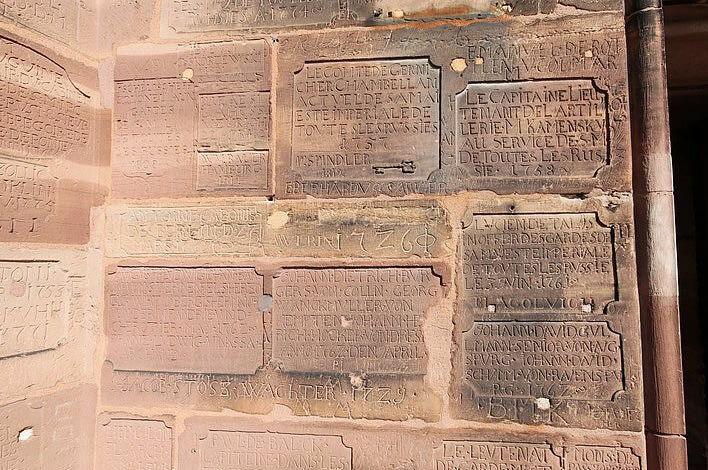 Image: Chapuy/Engelmann, Cathédrale de Strasbourg. Elévation géométrale (Tour et flèche), 1827. Bibliothèque nationale de France. One slip during Goethe's vertigo desensitisation training would have left a very large part of German literature unwritten, decorating instead the cobbles in front of the bistro 'La Cygne'. 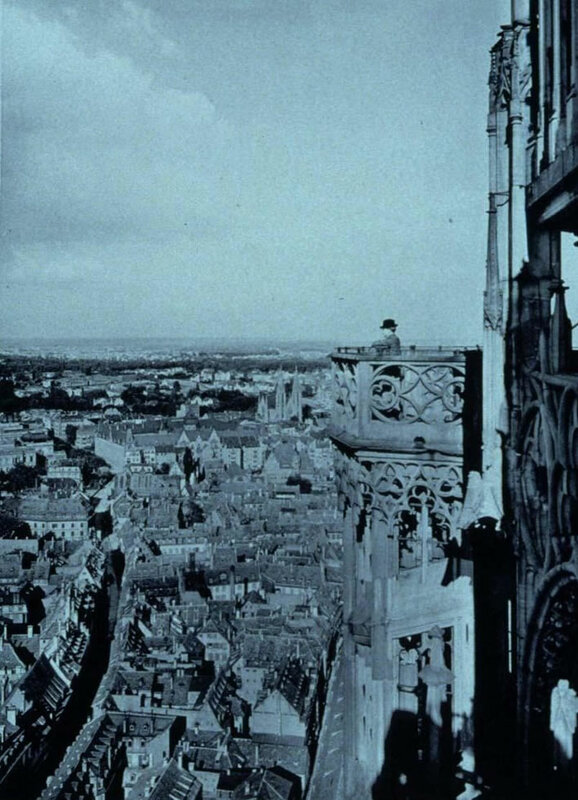 Looking out from the platform at the top of one of the four 'snails' of the middle tower, in the good old days (1906) when you could climb up here. At this point the observer is 106 metres above the ground. Image: Bibliothèque nationale de France. ^ Goethe, Johann Wolfgang von, and Walter Hettche. Aus meinem Leben. Dichtung und Wahrheit. Durchges. und bibliogr. erg. Ausg. Stuttgart: Reclam, 2012. Part II, Book IX, p. 400f. English translation ©Figures of Speech. Besonders aber ängstigte mich ein Schwindel, der mich jedesmal befiel, wenn ich von einer Höhe herunterblickte. Allen diesen Mängeln suchte ich abzuhelfen, und zwar, weil ich keine Zeit verlieren wollte, auf eine etwas heftige Weise. [Abends beim Zapfenstreich ging ich neben der Menge Trommeln her, deren gewaltsame Wirbel und Schläge das Herz im Busen hätten zersprengen mögen.] 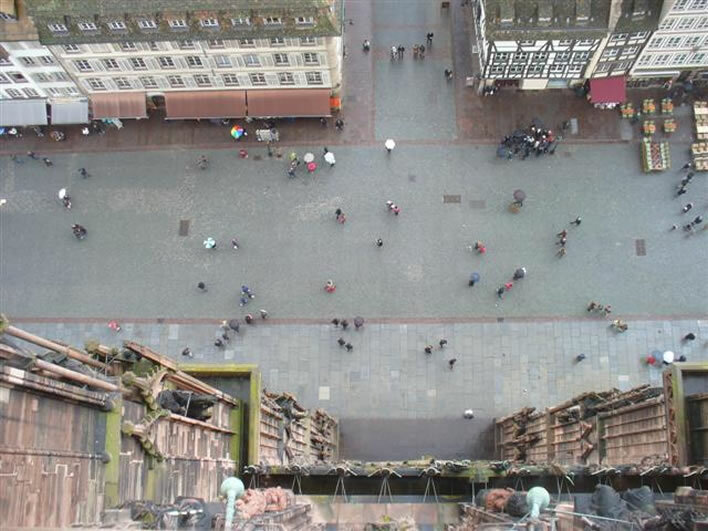 Ich erstieg ganz allein den höchsten Gipfel des Münsterturms, und saß in dem sogenannten Hals, unter dem Knopf oder der Krone, wie man's nennt, wohl eine Viertelstunde lang, bis ich es wagte, wieder heraus in die freie Luft zu treten, wo man auf einer Platte, die kaum eine Elle ins Gevierte haben wird, ohne sich sonderlich anhalten zu können, stehend das unendliche Land vor sich sieht, indessen die nächsten Umgebungen und Zieraten die Kirche und alles, worauf und worüber man steht, verbergen. Es ist völlig, als wenn man sich auf einer Montgolfiere in die Luft erhoben sähe. Dergleichen Angst und Qual wiederholte ich so oft, bis der Eindruck mir ganz gleichgültig ward, und ich habe nachher bei Bergreisen und geologischen Studien, bei großen Bauten, wo ich mit den Zimmerleuten um die Wette über die freiliegenden Balken und über die Gesimse des Gebäudes herlief, ja in Rom, wo man eben dergleichen Wagstücke ausüben muß, um bedeutende Kunstwerke näher zu sehen, von jenen Vorübungen großen Vorteil gezogen.